This circle shaped acrylic award is clear and available in three sizes. An Excellent Acrylic award for employee service award, sales achievement award, or other acrylic award recognition presentations. Image shown with full color imprinting on the front, available as an optional imprinting method to this acrylic award, and lasered to a frost white engraving on the back. 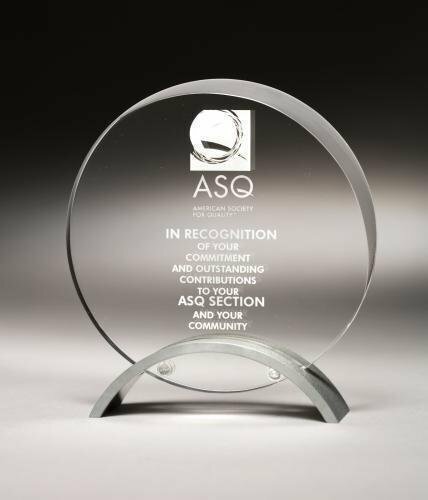 3/4" Clear Circle Acrylic Award available in four sizes, laser engraved to a frosted white text. Full color imprinting available as an option for this acrylic award. 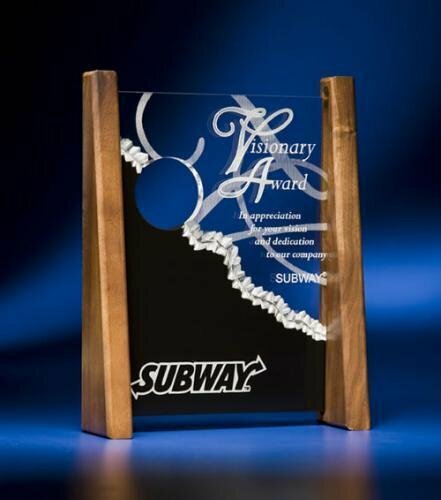 A Stunning clear circular acrylic award design accented with a silver colored arched base. Full color imprinting available as an optional imprinting method for this acrylic award.